Finally back home after a busy week with Ray in Las Vegas for the CES coverage, while backing up photo files, I ran across a few shots that a lot of you will find interesting. Last Monday, my first day onsite, Ray and I ran across the Garmin Connect IQ Program Manager, just randomly in a hallway. All this while we were navigating various far-flung CES venues seeking out a press conference, one that we never found. But it worked out for the best after all. I got a rare glimpse into how Ray operates; how he gets his great product scoops, and as a bonus, how he gets his great product photos. I know Ray has written about his photography before, but this is a unique viewpoint on said photography. It turned out that the PM just happened to have a few watches with him with some prototype Connect IQ software loaded on them. 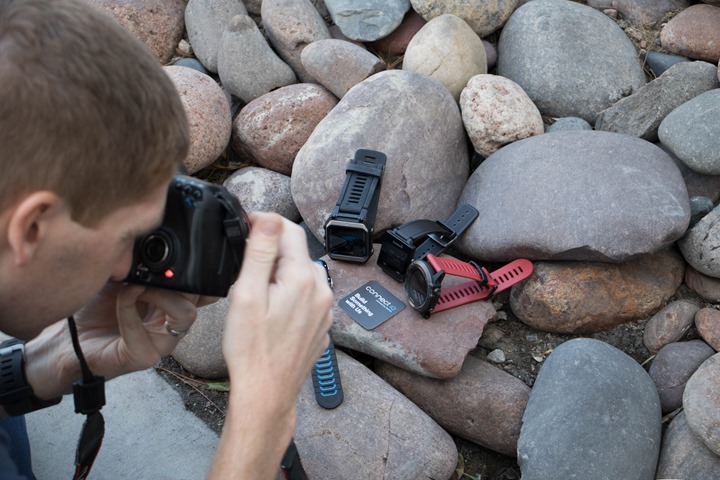 Taking advantage of a unique opportunity, Ray convinced him to allow for some quick product shots for his upcoming In-Depth post. Keep in mind that this happened early afternoon on Monday, a day before the conference officially kicked-off. With the gentlemen’s agreement in place to allow photos, Ray looked around at the dimly lit massive and bustling hallway we were standing in and started hunting a suitable location for a quick impromptu product photo shoot. Taking in the subdued lighting and the hallway decor, Ray instinctively determined that the ‘suitable location’ was about a quarter mile away, down through meandering hallways, stairways, and lobby areas at the front entrance to the Sands Convention Center. So off we went. Trust me when I tell you that Ray walks fast, very fast. I quickly discovered that is his secret sauce for covering the massive acreage of display booths we would be canvassing all week. And I don’t mean just fast walking, like a power-walking soccer mom, it was more like a full on trot for me, but just a casual pace for Ray. But the Garmin guy and I both managed to somehow keep up, all the while Ray was peppering him with probing questions about Connect IQ, where it was now and where it was headed. Once outside, Ray looked around and said “This is the spot”. Mr. Garmin and I looked quizzically at each other, since we were standing literally in the middle of traffic at the front entrance driveway. Traffic that was comprised mostly of fume-belching busses and taxis that were loading and unloading conference attendees. Hundreds of attendees, dozens of busses and other assorted vehicles in the few minutes we were there. Not quite sure what Ray had in mind, he led us over to the curb beside the heavily trafficked bus lane. We were like, What? Where? 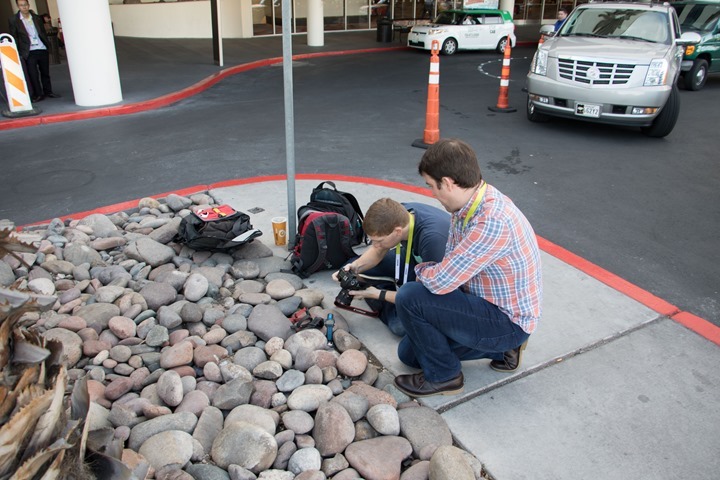 Ray points to the small patch of rocks crowded onto a little spot of typical convention center driveway landscaping. And given the desert locale of Vegas, this was more xeriscaping than landscaping. All while heavy traffic was zipping by. I know everyone driving by thought we were nuts. But, this is truly where the magic happens. And just like that, it was a wrap. No sets or lighting to disassemble, no transporting back into town. 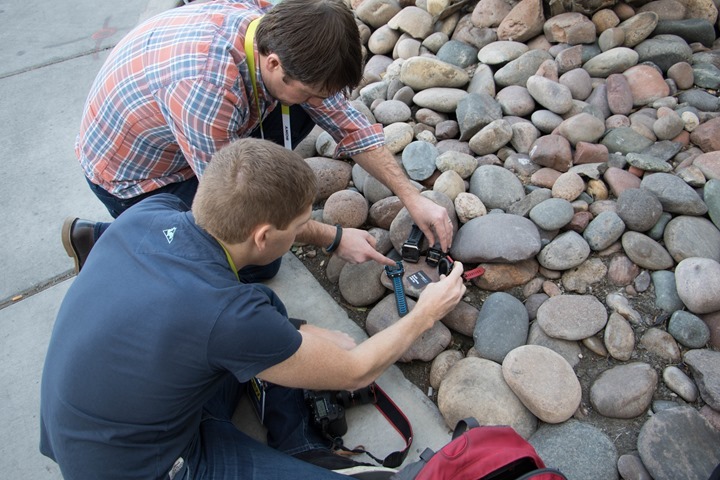 We just gathered up watches and backpacks and headed back into the maze of CES hallways and booths. I think ray just likes to make the garmin guys walk all over the place for kicks since they most likely had rocks in the lobby at one of the hotels! Plummer’s crack. Ray may be doing some photo ops with the Kardasians(as a model). Love you Ray. Thanks for all you do. Nice one, great work, as usuell. Like the “how it works/making of” stories to get a look behind the sceenes. Greatings from Germany! What!? No tripod? Just kidding. Good eye for using what is available. Outside light is always much better than artificial light. 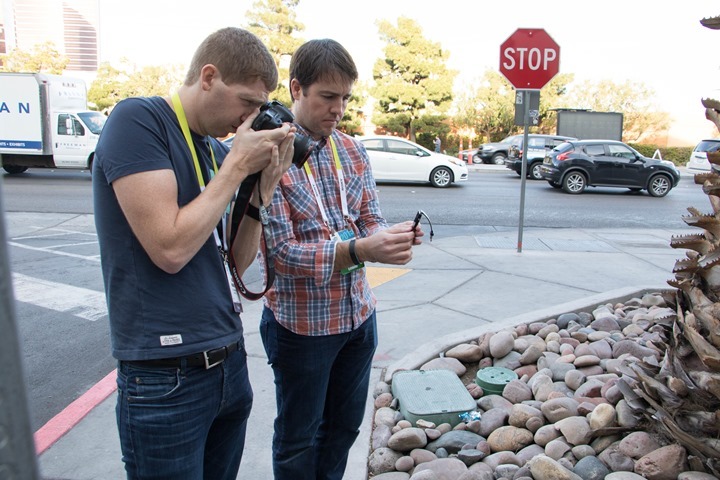 Interesting to see what you used for a camera. 7D, one of these days I might upgrade it, but just didn’t like what came in the 7DM2. Been watching rumors on the 5DM3…we’ll see. I pretty much only use the iPhone for weekend shots (5 Random Things) as well as Twitter stuff. What camera do you use when taking photos on a run ? Like when you ran the Santa run, you took lots of photos. And all at a 6 min / mile pace ! very briefly, why don’t you like the 7D MkII? I’m both puzzled why you don’t like the 7dII and by what you mean with 5d3 “rumors” since it’s a camera that’s already out over 2 years. For these type of shots I’d pick the 5d3 or one of the next generation (there ARE plenty of rumors going around about a new model coming up) can’t beat the nice FullFrame images. I’m surprised you use the 7d (I got that camera myself, but my main interest lies in wildlife use) as for myself I find the specs on the 7dII superior on nearly all fronts and those that aren’t superior are at least similar compared to the first edition. Thanks for clearing up the iphone/full camera usage, makes totally sense in hindsight (iphone for twitter and summary pictures). Sorry, mean 5DM4 rumors, not M3. As for not liking the 7DM2, I was personally really liking for WiFi. The challenge I have is I do tons of shooting in the studio and I’d really like to have those files immediately sync’d to a file share and available. It was rumor’d to have it, and then cut at last minute due to the casing interfering with WiFi. While I can get the WiFi accessory – it’s silly expensive. Bet the vendors get nervous with their last minute prototypes getting unplanned closeups. But Ray makes just about anything looking like a high-dollar photo studio shoot. I’ve always loved your photography, great job Ray. Thanks for the post Randy. I’m really enjoying your contributions to the site. Thanks for always matching quality photography to your in-depth reviews and other posts. I’ve enjoyed Randy’s posts, great addition to the blog, and now on top of that we get a “behind the scenes”. Awesome! +1 for this – one of the great benefits of a sidekick. Randy, I cannot say thank you enough for publicly announcing Ray’s walking paces. The man thinks it’s just me because I can never keep up! Just be glad you haven’t had to do the airport walk with him yet! He WILL leave you behind (or in my case stick you on the luggage cart and push you around the terminal!). I hope you have had time to recover since the Las Vegas dry air CES Marathon! To The Girl: Yep, he’s a fast strider alright. I can only imagine the challenges you must face once he is underway. But, actually I’m a bit jealous of the luggage cart ride. and i thought this was taken on a beautiful sunny beach with naked women in the background. Any decent photographer gets good at having an “eye” for photo shoot locations. True, but it takes a good mind to remember these spots while your mainly thinking about what the CES may come up with. But the pictures on this site are always nice so I bet Ray keeps in mind that photos will be needed and secretly adds a little “spot the nice photography places” to his daily agenda.